Look out! Bobby and The Aristocats have arrived on the music scene and this party and show band is Sizzling HOT! Bobby, along with his two female cats rock a front line full of energy that will keep your dance floor hopping as they play everything from the Classic Standards to R&B, Funk to Country, Jazz to Hip-Hop, Motown to Disco, and Oldies to today's Top Hits. Their diversified repertoire of songs allows them to create the perfect musical experience that appeals to the young, old, hip and not-so hip. Bobby and The Aristocats can tune into your personalized frequency giving you the interactive experience of a lifetime. Imagine being whisked off into the era of the "James Brown & Motown Soul Revue," maybe relaxing to the cool swagger of the "Soulful Rat Pack," or even dancing the night away to that "Old Time Rock & Roll." Whatever your cup of tea may be, Bobby and The Aristocats have a multitude of costumed, themed sets and musical revues. That being said, you can always mix and match, or have a little bit of both by adding a theme or musical revue to your party format. Whatever they do, the audience is always the star and is encouraged to participate. Bobby and the Aristocats look forward to performing at your next event. 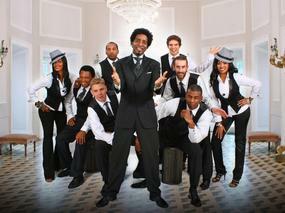 This thrilling 9-piece party and show band comes complete with the option of adding exciting interactive dancers. Their choreographed dancers add that "special" touch to any event, and they are a regular part of Bobby and The Aristocats. And if this is not enough, ask about their customized song service, where Bobby can write, record and burn on CD an original song for any occasion. So, whether you desire smooth jazz during dinner and then dance the night away, or a full choreographed show band with dancers, "Your Wish is their Command". More importantly, when you book Bobby and The Aristocats they provide you an Entertainment Consultant to help plan and tailor the evening to meet your needs. Remember, an Amazing and Electrifying Party begins with Bobby and The Aristocats! Ability to accommodate choreographed "Theme Shows and Musical Revues"